The grape trivia series is back (tell me how happy you are about it! ), and today’s subject is Grüner Veltliner. Grüner Veltliner is a grape which: has some Italian roots in his name; believed to be growing for a few thousands of years; had no known pedigree until 2007. The name Grüner Veltliner stands for “green veltliner”, and veltliner appears to be derived from the name of northern Italian region, Valtellina. The official name of the grape, Grüner Veltliner, seems to appear for the first time in 1855. And only in 2007, after quite an extensive DNA research, it was established that Grüner Veltliner was the result of natural crossing between Savagnin (Traminer) and practically extinct grape which even had no official name when it was found, so it received name of St. Georgener-Rebe, based on the name of the locality where it was found. Grüner Veltliner has a “middle of the road” ripening season, growing successfully in many European countries. It is, however, susceptible to many types of grape diseases, so it requires attention in the vineyard. 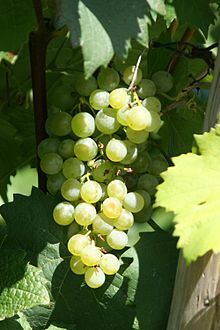 Grüner Veltliner generally produces healthy amount of small green-yellowish grapes, so again the special care should be taken to avoid overproduction. Grüner Veltliner is quite versatile in terms of potential styles in which the wine can be made – sparkling wines, dry table wines (both with and without oak aging) and late harvest wines are all successfully produced from the grape. In its more typical expression, as a dry table wine, Grüner Veltliner is known for its acidity and green veggies profile. Coming from the Austrian region of Wachau, home to arguably best renditions of the grape, Grüner Veltliner is also known for its expressive minerality. Often green and restrained while young, Grüner Veltliner wines can develop a considerable complexity as they age and in opinion of the experts (never tried aged Grüner Veltliner myself) can even rival some of the best Burgundies. Austria has the biggest plantings of the Grüner Veltliner, more than 42,000 acres. Grüner Veltliner is also popular in Czech Republic, Slovakia and some other European countries. As of late, the grape also made its way into the number of New World countries – Australia, New Zealand, United States all have number of plantings of the grape and it seems to produce quite promising results in those regions. And now, to the quiz! Q1: These flavors are usually associated with red wines, but it is not uncommon to find them in the description of the Grüner Veltliner wines. Do you know what flavors are those (multiple answers are possible)? Q2: These vegetables are notorious for been a “wine killer” – in terms of successful pairing, it is. And yet Grüner Veltliner is one of the unique wines (if not the only one) which is known to be able to pair successfully with those offenders. Do you know what vegetables we are talking about? 1. pepper and tobacco 2.asparagus or artichokes 3.false 4 Australia 5. I thought all 5 areas grow GV but I will guess Croatia I know the other 4 definitely are known for GV. Great work Mario, thanks for playing! The answers are coming on Wednesday.